Jim Romenesko, for those who aren’t in the news business, runs an essential blog that serves as a clearing house for information, gossip, bad headlines and assorted gaffes. A Jan. 6 post dealt with former Times columnist Al Martinez, who died Monday, and the occasional columns Al wrote over the years about a dying boy who craved peaches. Russell elaborated on his skepticism in “Why I Have Trouble Believing the ‘Get the Kid His Peaches’ Christmas story,” noting that he had written to Al for help in finding the original. We have some answers — and the story — with a not-so-gentle reminder for reporters: DON’T write from memory or bad things can happen. Use the clips. It’s what they are for. Memory can compress time and erase crucial details, as we will see with Al’s story. After a bit of digging, we found the story about the dying boy (actually age 18) who craved peaches. It was published on the front page of the Oakland Tribune on April 23, 1958, but as was the custom in those days, there is no byline. Al’s career paralleled mine somewhat. We both moved to the Valley edition, where I edited more of his columns, and finally he progressed to writing for the main paper, and again, I edited some of his columns in Metro. Never in all that time did Al fabricate even a single line of a story, as far as I know. Al tended to repeat himself as columnists do after many years in harness, but fabricating a story out of whole cloth was never an issue. Fortunately for the conscientious researcher, the Newspaper Archive (available through the Los Angeles Public Library) has the relevant copies of the Oakland Tribune, where the story about the boy and his peaches originated. And interestingly enough, I found another series of stories in the Oakland Tribune about a dying boy who craved – watermelons. Exactly nine years earlier. April 23, 1949: About Christmas 1948, Ronnie Calvert, 3, was diagnosed with leukemia and began asking for watermelons, which were out of season in December. He finally got some in April 1949 that were flown to California on a B-29 and delivered by an Air Force crew in Operation Watermelon. This somewhat sounds like Al’s story: As reported on April 23, 1949, dying boy with a craving for out-of-season produce. But it was in 1949, long before Al started working at the Oakland Tribune (1955) and even before he started journalism courses at UC Berkeley (1952). So I began looking for Al’s bylines in the Oakland Tribune, specifically if he had written any stories about peaches. Again, it was customary in the 1950s to publish stories without bylines. Today, stories carry multiple bylines and conclude with assorted taglines, email addresses and Twitter handles, until they are almost as long as movie credits. In those days, however, reporters rarely got bylines, so it’s impossible to locate all of Al’s stories. Al’s first bylined story for the Oakland Tribune — according to a Newspaper Archive search — was on Oct. 22, 1955, and his last was Sept. 20, 1971. 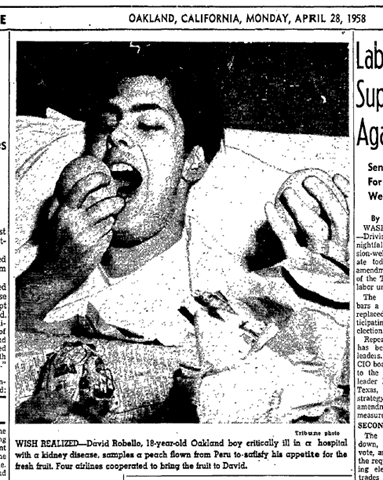 In searching that period, we find that Al wrote about the boy and his peaches for the first time on July 1, 1962, on the retirement of Oakland Tribune City Editor Alfred P. Reck. Here’s the germ of the story: “And he wasn’t above calling halfway around the world to have out-of-season peaches sent to a dying boy a few scattered years ago,” which establishes a time frame — “a few scattered years ago” – and implies that Reck was the one who got a dying boy out-of-season peaches. 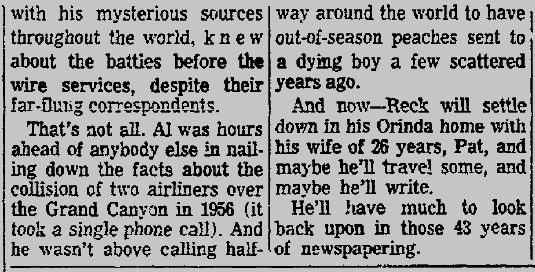 Here’s what Al wrote almost five years later, on April 19, 1967, upon Reck’s death. Notice that there is no time element. It’s not a Christmas story – yet. The Robello family placed a classified ad in the Oakland Tribune requesting help in getting peaches for their son David, who was dying of a kidney infection, the result of rheumatic fever. An amateur radio operator named John Aldredge saw the ad, took up the project and after 15 hours of trying to contact someone, found a fellow ham in New Zealand who began arrangements to send peaches to the U.S. at his own expense. But it’s not until 1986 — 28 years later — that the tale of the boy and his peaches became a Christmas story. Writing on Dec. 25, 1986, in The Times Westside edition, Al recounted the peaches story – but he set it at Christmas. Perhaps Al conflated the stories about Ronnie Calvert, the boy dying of leukemia who craved watermelons in December 1948, and David Robello, the dying youth who craved peaches around Easter 1958. Perhaps he took artistic license and set it at Christmas. Or perhaps after 28 years, the details had faded from his memory. I can say from personal experience that after writing thousands of posts about Los Angeles crime that it’s impossible to remember them all and that the details can erode — which is why newspapers have clip files and why reporters ought to refer to them before writing anything. Whatever the reason, the dying youth (Robello was 18) became a dying boy who had leukemia instead of a kidney infection – and it happened on Christmas Eve, all because of dauntless City Editor Alfred P. Reck. Update: Al also wrote a version of the story, posted Dec. 24, 2011, at the Daily News of Los Angeles. In his final version, Dec. 19, 2013, Al repeated the story on L.A. Observed. It’s clear from even the slightest glance that Al wrote the story from memory rather than referring to his 1986 version and the story is changed even more – which is why reporters should always check the clips. David Robello got his peaches, but they were from Peru. And it was five days later, with the first story appearing April 23, 1958, and the last on April 28, 1958. The bottom line: The incident occurred more or less as Al described it, but five days were compressed into one day, the details were eroded and the Christmas element was wrong. In all, this is fairly typical of the tricks our memories play on us. Still, Al’s lesson, “Get the kid his peaches,” may be a good one, at least if you are David Robello. The Oakland Tribune never reported his death. Nor can I find any record of him in the California Death Index. Maybe those peaches did the trick. Rest in peace Al. Your reputation is untarnished – but when you get to that big city room in the sky, check the clips. OK? This entry was posted in 1949, 1958, Books and Authors, Columnists and tagged 1949, 1958, Al Martinez, Romenesko. Bookmark the permalink. Many thanks. This is terrific. I appreciate all the information. There are lessons for us all here. This just made my day, Thanks! Librarian for the Tribune here. Good find on the watermelon story, however those clips on Reck and Robello were sent to Russell back in 2014. David Robello is my uncle. I have his actual scrapbook from when he was in the hospital. Don’t know if there is any connection to the transition from April to Christmas, but we have an original UK newspaper from 4th December 1958 about a 10 year old dying boy in London asking for a peach.